2018 is on track to be the fourth year of stagnant real estate sales numbers. If the present trend holds, there will be fewer than 2200 sales this year. 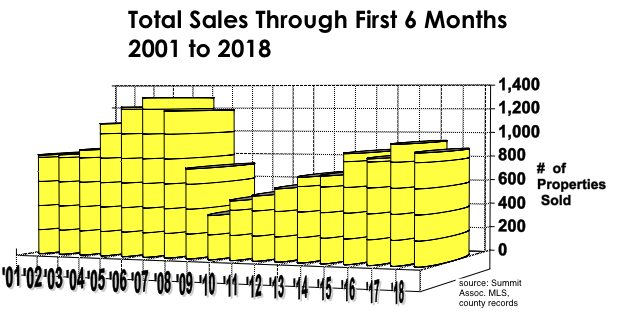 This is a far cry from the peak years of the mid-2000’s when about 3000 per year sold. Stagnation in the midst of a market where new listings are snapped up in hours at record prices: this is what a no-inventory market looks like. And the result is fewer properties are sold for ever-higher prices. There was only one month of the first six in 2018 where more properties sold than the previous year. Overall, there were nearly 7 percent fewer sales in the first half of the year than in the previous year. The inventory of properties for sale at the end of June, always the peak inventory for the year, was fewer than 750. And 200 of them were vacant land. That left about 500 residences of any kind or price for sale. But wait… only 280 of them were priced under $1 million and 90 were priced under $500,000 and 10 of those were deed restricted. 372 residences were under contract, 150 of which had sold in seven days or less. 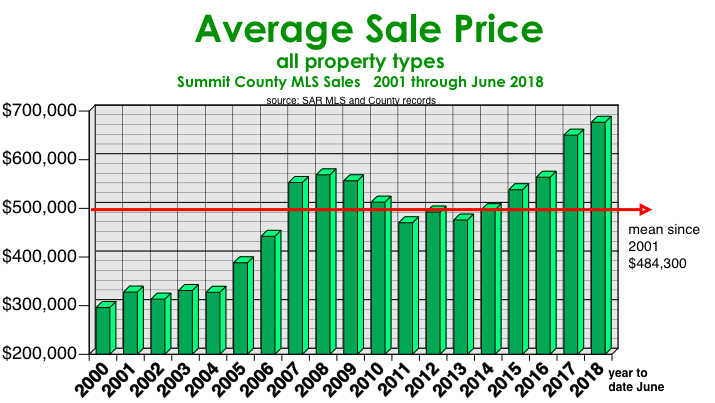 Each year since 2010, the peak inventory in Summit County has been lower than the year before. Eight years of declining availability has created a chronic undersupply situation that has driven prices up steadily and sometimes alarmingly. In 2017 the average residential sale price increased by over 15 percent. So far in 2018, residential prices have increased by only 3.8 percent and this during the part of the year that historically brings the highest average price for the year. So the price inflation may be slowing. In fact single family home prices are down about 3 percent so far this year. Days on market are getting shorter. So far in 2018 it has averaged 84 days to go under contract. Last year it took 102. Land is making a minor comeback with an average price that increased by 13 percent in the first half on 91 sales as opposed to 69 in the first half of 2017. This reflects the increase in the price of a single-family home to an average of $1.1 million currently. It is starting to make sense to build instead of buying an existing home. It still takes 311 days on average for land to sell, however, down from 353 last year. Remember, there were still 200 lots for sale on June 30 however. In a normal market, an urban area for instance, the shortage of property for sale would bring builders in to fill the void. This is what is happening on the Front Range where urban sprawl stretches from Colorado Springs to Ft. Collins and every piece of buildable land is being used. 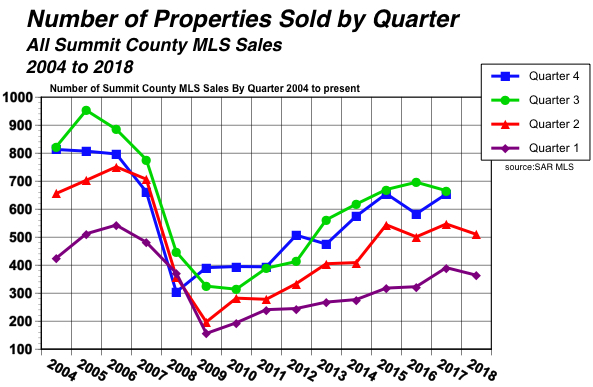 But in Summit County, we are out of land. What new construction there is has been in ones and twos on infill lots. Or County government acquires some unwanted Forest Service land or uses some vacant land the towns have been sitting on to build affordable deed-restricted local worker housing. 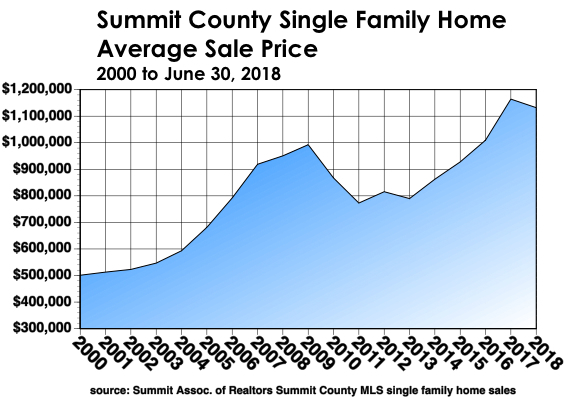 New market priced development such as Angler Mountain Ranch, Silver Trout and Summit Sky involve a relative handful of new construction homes at prices beginning in the $900’s and way up from there. It’s only gonna get tighter, folks. No relief from new construction, more people with disposable income wanting to be here, and those who are already here holding on like sea urchins in a heavy tide.